After sparking their discography with Tech Support‘s chunky discoboogie Inside Out EP, NYC-based party and label Homage is back with a new effort. 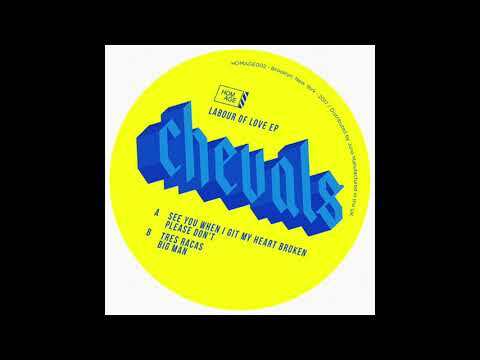 This time, it’s from the hands of Chevals (soundcloud), a new Parisian producer on the scene with a knack for cheeky edits and flips. The Labour of Love EP pays tribute to the workers across the world and features a grizzly gunslinger on the design. Sonically, the record is as global as its motivation; pulling samples from afrolatin and traditional disco sources alike.While the A-Side hosts the surefire Zapp stomper “See You When I Git My Heart Broken” and the swinging adventure of “Please Don’t”, the flip dips more into the southern hemisphere for it’s inspirations. In the B1 slot, we have our premiere, “Tres Racas”, which is, in short, an expertly beefed-up take on a Brazilian samba classic. Meaty hand percussion and a rolling bassline start off the affair before the Frenchman layers in the chanting vocals and finger-picked guitar sample. The middle third of the track serves as a bit more climactic; escalating both in vocal action and drum breaks. Ultimately, the cut settles back into an outro groove reminiscent of our sweetly paced introduction. A fine cut for purveyors of Brazilian and Afrolatin edits and house productions. Keep an eye out for the record, which drops in early October. And keep an eye on Chevals, who is rumored to have some serious heat coming soon on a couple other American imprints. Order on Juno now!